Noah Salem, a senior at The Met's Justice Building and E360 Alumni, was recently named a 2017 Distinguished Scholar by The Horatio Alger Association of Distinguished Americans. As the only Rhode Island high school student to earn this year's prize, Salem will receive a $25,000 college scholarship in pursuit of an Advertising and Media Production degree, as well as an all-expenses paid trip to Washington, D.C., to participate in the National Scholars Conference. The scholarship is awarded to students who exhibit strong commitment to pursue and complete a bachelor’s degree at an accredited non-profit public or private institution in the United States, are actively engaged and involved in co-curricular and community service activities, as well as display high-levels of integrity and perseverance in overcoming adversity. Salem was excited to receive the award, though in typical entrepreneurial fashion, was not willing to rest on his laurels. "My plan is to apply for $1 million worth of scholarships by the end of the year," he told his advisor Nate Bonneau, who is eager to support his student navigate the work intensive process. 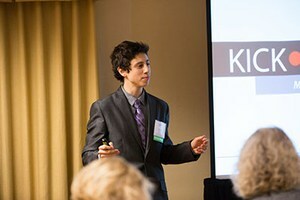 You can learn more about Noah Salem here and The Horatio Alger Scholarship here. For a complete list of the 2017 National Scholars, click here. The Met is a network of six small, public high schools located in Providence and Newport, Rhode Island. With high standards and strong family engagement, the Met’s individualized learning approach has proven successful in unlocking students’ passion for learning. The Met empowers its students to take charge of their learning, to become responsible citizens and life-long learners. The hallmarks of a Met education include internships, individual learning plans, advisory, and a breakthrough college transition program.